Jay has lived in a once well-populated mining town in Colorado’s Rocky Mountains for all of his fifteen years. Orphaned when he was very young, he spends most of his time working at his grandmother’s store or as a cattlehand in Payrock Canyon with his friend Doc. Toward the end of the summer, all sorts of strange things start to happen in Payrock: Bighorn sheep are dying mysteriously, black beavers turn brown, cattle are running themselves off of cliffs, and young twins strand themselves on a dangerous precipice. The town curmudgeon claims it has something to do with a wandering stranger who carries an odd box . 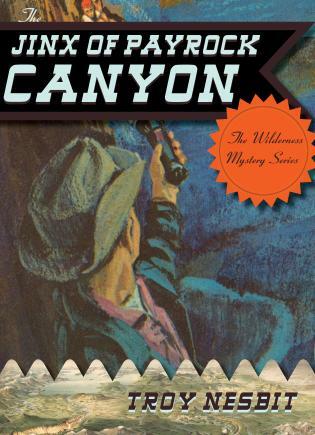 . . but will the boys be able to stop whatever’s going on before all of the canyon’s wildlife disappears? The recurrent themes of the books in the Wilderness Mystery Series are natural phenomena—caves, canyons, mountains, sand dunes, and forests—and a sense of the past as seen through archaeology. In many of the narratives, events of long ago are seen to have left traces of their passing. Notwithstanding the fact that the books were written in the 1950s, the progressive Franklin Folsom (alias Troy Nesbit) had refreshing views of women, Native Americans, and the environment, and he was prescient in having his characters often oppose corporate and government efforts to develop wilderness areas. Troy Nesbit was a nom de plume of the late Franklin Folsom, a graduate of the University of Colorado and Rhodes Scholar at Oxford in 1928. The author of over eighty books under various names, he was also an avocational anthropologist and wrote several scholarly books on Native Americans of the American Southwest. [Folsom] brought high ideals to the [mystery] genre, and he deserves to be better known among those who read and collect series literature.